In conjunction with the San Francisco Textile and Tribal Arts Show 10th-12th February at the Festival Pavilion in the Fort Mason Center, Peter Pap is mounting an exhibition of exceptional Northwest Persian and Caucasian rugs in his gallery at 470 Jackson St. The emphasis is on rugs from the first half of the 19th century that exhibit the saturated colours that have long made the weavings from this region sought after by connoisseurs. Gallery hours are Monday - Saturday 10:00 - 5:00 or by appointment. The exhibition will run through March 15th. This exceptional Shirvan demonstrates the importance of balance to the success of composition. A green multiple key-hole design floats on a red ground with corner-pieces and animals spaced perfectly. An organic sense of movement is achieved with floating comb-like elements on the white ground surrounding the key-holes. Framing this composition is a series of three borders of equal width composed of alternating multi-colored rosettes on white grounds and a directional border of interlocking red an Very small area of missing knots and small re-piled wear crease, approximate 10" adjusting cut one side. Some unevenness and mending in original selvedge. 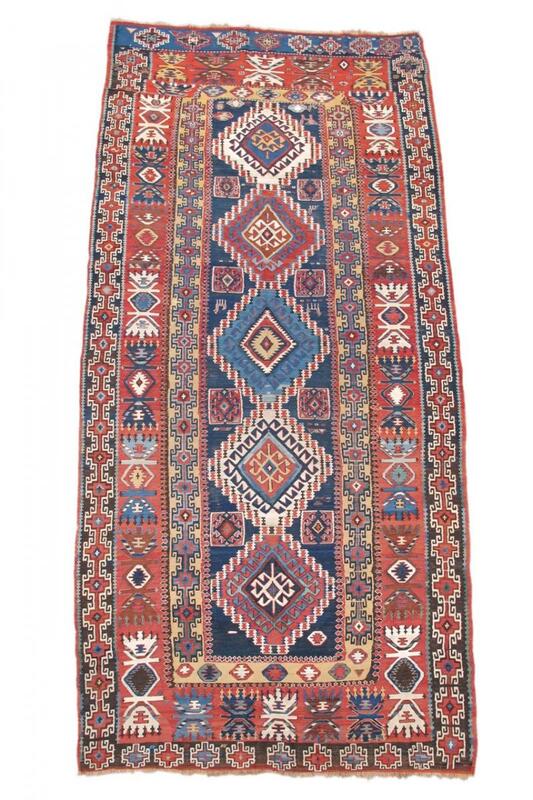 SIZE: 3' 5" x 9' 8"
While all-over fields of various types are found in a multiplicity of weavings from across the Near East, the best of these are far from uniform or standard. 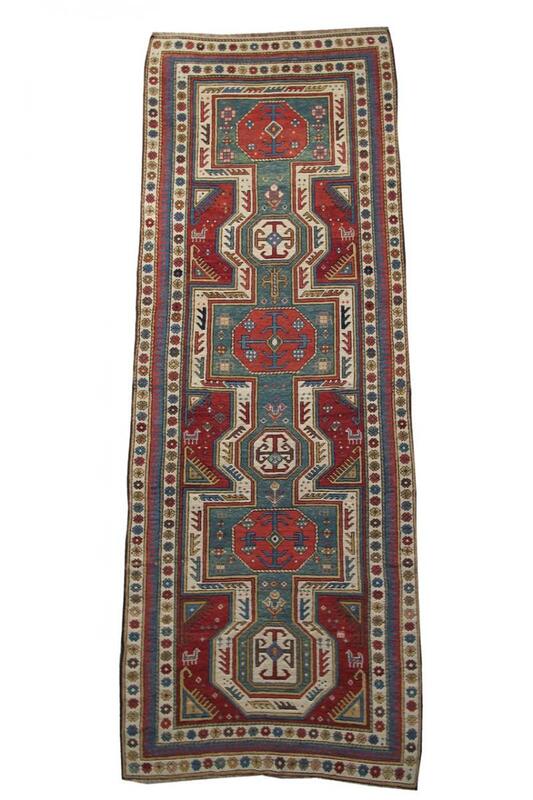 This Shirvan rug from the south Caucasus uses a repeat of diamonds on a red field. The diversity of these floating elements is extraordinary. A tremendous amount of variation can be seen in their coloring, articulation, and even in how they are clustered in different segments of the field. It is this variation and attention to detail that All original condition with full pile. A few very tiny spots of old topical moth damage. 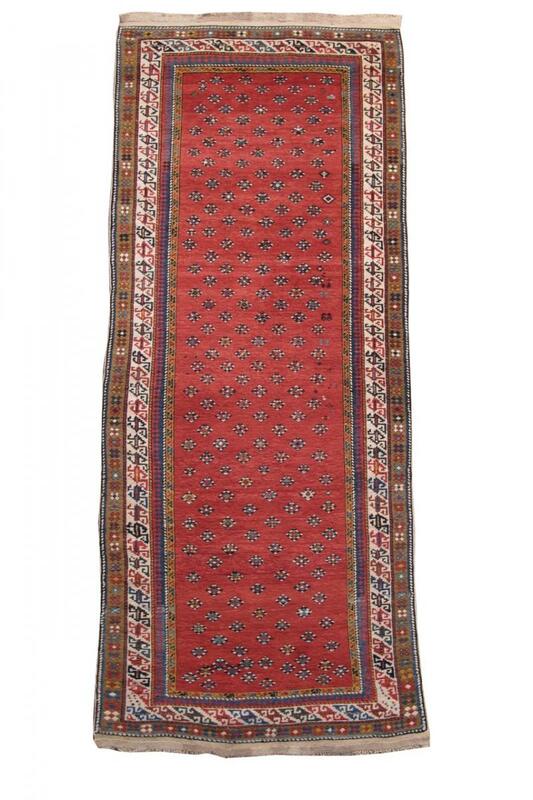 SIZE: 3' 4" x 7' 10"
This dynamic, colorful and finely woven Shirvan flat-weave gives more than ample evidence that the best antique kilims produced need not to have originated in Anatolia. Bold latch-hook medallions with a variety of centers are drawn in red, blue and white against an indigo field and set within a classic 2-1-2 formation against smaller diamond and latch-hook centered box ornament. The main border, a particularly idiosyncratic variation of the so-called ﾑharshangﾒ or crab border gives evidence of Original condition with minor separations of slip weave tapestry technique. Very minor re-weaving. SIZE: 5' 7" x 11' 2"
Utilitarian bags and trappings attributed to the Shahsevan of northwest Persia and the southern Caucasus are among both the most enigmatic and collectable of traditional weavings from the Near East and Central Asia. These elegant bags are woven in the flat-woven sumac technique, sometimes known as snare-stich. The diverse and vibrant colors are all derived from natural sources. 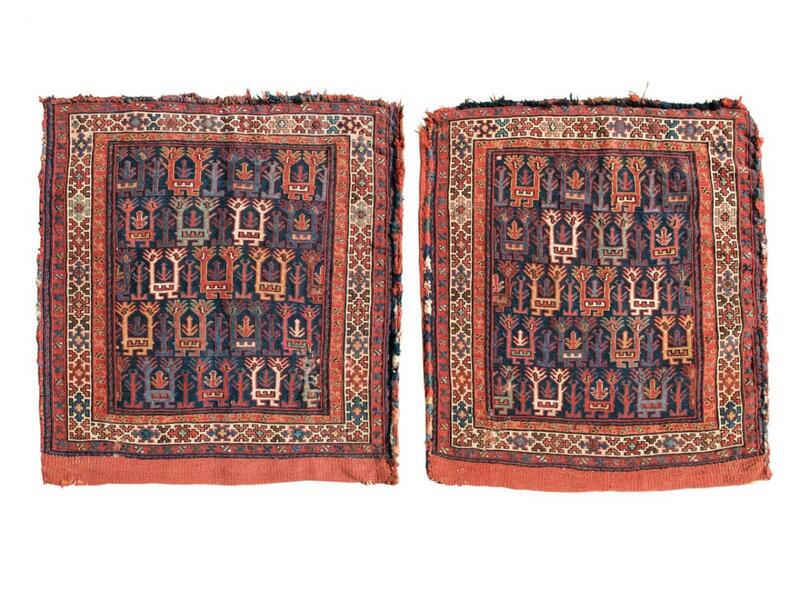 The fields of these pieces depict a subject matter frequently encountered but little understood within the repertoire of Shahsevan weaving, a double-headed animal alternating with what appears to be trees. The origin of this imagery is unclear but there may be some relationship between it and the so-called ‘animal tree’ imagery sometimes found in Turkmen weaving. Regardless of its origin or meaning its drawing remains compelling.